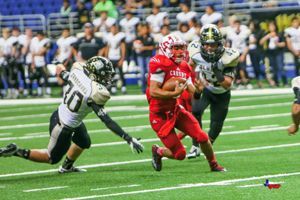 SAN ANTONIO  Port Lavaca Calhoun was stunned by the first play of the game, as the Cougars Craig Williams returned the starting kickoff 90 yards for a touchdown, in the first 12 seconds of the 5A Division II Region III playoff round. Then the Cougars went for a two-point conversion, just to ice the cake and led 8-0. Hoping for a home field advantage because they were playing in the Alamodome, Calhoun was not to see any points until halfway through the third quarter. Crosby scored two touchdowns in each of the first and second quarters, and led at halftime 29-0. It was the sign of a hard fought game, that Crosby had 5 penalties for a 60 yard loss, and Calhoun had 7 fumbles to set their offense back. Cougar scoring came on the kickoff run back of 92 yards with 12 seconds off the clock in the first quarter; then another TD with 1 minute left in the first quarter on a 4 yard run by Tristan Cotton. In the second quarter, Crosby scored 7 minutes into the period with an exciting 55 yard run by Carlos Grace, and then an 11 yard TD run by Craig Williams with 3 minutes until halftime. Crosby had a balanced attack, with passing 6 for 11 attempts and 107 yards. However, they had 2 interceptions, and that is how Calhoun scored their first points, in the third quarter. Joe Caldera intercepted a pass for a TD and the first Calhoun points, making it 29-7. Crosby scored again in the third quarter on a 5 yard run by Emmanuel Netherly. The final score of the game was by Calhoun, with 6 minutes left QB Gavin Trevino threw an excellent 48 yard pass to Trey Ross for their second touchdown. The final score was Crosby 36, Port Lavaca Calhoun 14. 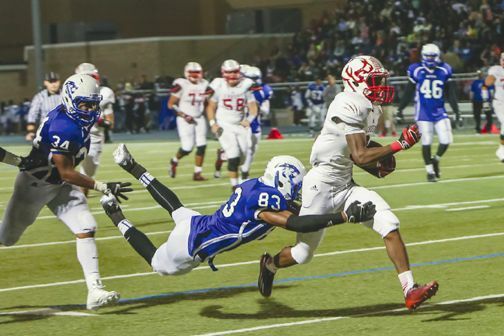 Next game for Crosby Cougars vs Brenham Cubs, Saturday at 6:00 p.m. at Conroes Woodforest Stadium. HIGHLANDS, CROSBY, BARRETT STATION, HUFFMAN  Harris County Precinct 2 Commissioner Jack Morman has his Senior Director of Infrastructure, Jeremy Phillips, working to find what these areas need and so far he has made a long list. We have made numerous improvements and repairs to this areas parks.  said Philips talking of exciting changes for local kids to the area parks. Riley Chambers Park  Renovate restroom, repair concessions stand, and addition of a new press box. In the process of wrapping up a Master Plan for the park. Identifying additional projects for this park in the near future. Crosby Park  Addition of a press box. New playground equipment coming early 2015 at a cost of $190,000. Highlands Park  New Playground equipment in early 2015 at a cost of $233,289. IT May Park  Ongoing improvements to the fields and infrastructure. We have completed the installation of anew on-site septic system and drainage improvements. We are working on adding to new additional baseball fields. We are wrapping up the  BetterStreets2Neighborhoods Project that includes Ramsey Road and Old Atascocita Road at a cost of $1,829,638.  said Phillips. N. Main at FM 1942 – widening the intersection and the lanes near the intersection to improve the efficiency of traffic in the area; this is a joint effort with TxDOT. TxDOT will install the light and the County will widen N. Main to accommodate dedicated turning lanes at the intersection. Crosby Lynchburg Phase 1  FM 1942 to Arcadian Road widen to 5 lanes (including a center turn lane). Bids are being evaluated and construction should begin after the first of the year. Philips said detailig projects funded and about to start. Crosby Lynchburg Phase 2  Arcadian to Magnolia widen to 5 lanes with a center turn lane. Bid after the first of the year so construction will be continuous. Our partners at TxDOT are wrapping up the design portion of US 90 to FM 1942  once constructed TxDOT should provide a widened road between US 90 to FM1942. Wallisville at Crosby Lynchburg  Traffic signalization improvements and additional turn lane. CROSBY  Soon a Lifeflight helicopter will be able to land in this area inspite of most rain or harsh weather thanks to the efforts of local first responder tax entities. This will benefit victims of mayhem from as far away as Chambers and Liberty County. This area will have an instrument guided emergency heliport, the only one in Unincorporated Harris County and about a twenty mile circumforance at Crosby Volunteer Fire Station #1 on U.S. 90 once agreements and construction have been completed between HCESD#5 (the tax collection agency for HCESD#5 the ambulance service of Crosby, yes they have the same name) and HCESD#80 the tax collection entity for Crosby Volunteer Fire Department. Agreements have been in the works for nearly a year now, both agencies have lawyers carefully going over who will pay for what. The Crosby Volunteer Fire Dept.s tax collection entity HCESD#80 signed an agreement on Nov. 11 and sent it to HCESD#5 for review. The next phase to complete this life saving marvel is to have a contractor and architect hired to begin the work. There are two parts to this modern marvel. Part one is a heliport, a physical landing area at Crosby Volunteer Fire Department Station #1 to be built near the retention pond that is to be built for a helicopter to land and pick-up patients to be flown to trauma centers like Hermann Memorial. Then there is to be an instrument guided flight plan path that when weather obscures vision or otherwise offers challenges to normal, visual flight this F.A.A. approved flight plan guided by Global Positioning System can be used to have a helicopter safely touchdown at this location from the hospital. Flight plans are documents filed by a pilot or flight dispatcher with the F.A.A. prior to departure which indicate the crafts planned route or flight path. Flight plan format is specified in the ICAO Doc 4444. They generally include basic information such as departure and arrival points, estimated time en route, alternate airports in case of the unexpected, type of flight (whether instrument flight rules [IFR] or visual flight rules [VFR]), the pilots information, number of people on board and information about the aircraft itself. Flight plans are highly recommended, especially when flying over inhospitable areas as they provide a way of alerting rescuers if the flight is overdue. IFR flights, flight plans are used by air traffic control to initiate tracking and routing services. For VFR flights, their only purpose is to provide needed information should search and rescue operations be required, or for use by air traffic control when flying in a Special Flight Rules Area. This will provide much expanded Lifeflight capability for the Crosby area and a radius of about 20 miles around. It is expensive to put together and both the ambulance and fire departments tax entities have carefully trimmed cost while making sure to provide high standards for all equipment involved. It will have all F.A.A. required lighting for landing at night, said Randy Foster of ESD#80. 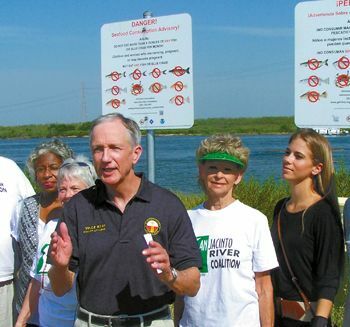 HOUSTON  The lawsuit that Harris County Attorney Vince Ryan filed against polluting companies responsible for the San Jacinto waste pits ended last Thursday, with an unexpected result. Two of the polluting companies, Waste Management and their subsidiary McGinnes Industrial Maintenance Corp. agreed to a settlement before the trial went to final arguments. They agreed to pay $29.2 million in penalties to the plaintiffs. The third company, International Paper, was excused from the suit by the jury on a 10-2 vote, late in the afternoon. 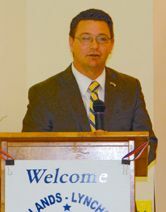 Speaking at Highlands Rotary club this week, county attorney Vince Ryan said that the money would be split in thirds, with $9 million for expenses and attorney fees, and the rest split between the state and the county. The money will go to the general fund, he said, not for clean-up of the sites. He hoped, as Commissioner Morman had said last week, that some or all of the county money would be used for environmental projects near the river, but the county will have to decide later on this. The county had originally asked for damages amounting to $25,000 per day for all the time the waste pits existed, back to February 1973. This would have amounted to over $400 million dollars, with interest. However, the settlement was far short of this. Ryan was asked if this was a victory or defeat, and he said that they never expected to get a big settlement, but it was a victory because a message was sent to industry that they were responsbile for their wastes, even years later. The attorneys for International Paper had argued that they were not responsible for the waste after it was turned over to McGinnes and out of their control. The attorneys also said that the county had failed to show examples of dioxins escaping from the pits on a regular basis and causing health problems in the population around the riverfront. Ryan said that this ends the lawsuit between the county and the waste companies, but he feels that the judge was incorrect in ruling that International Paper was not a responsible party, and he plans on filing an appeal very soon. Some evidence was not admitted in court, he said, that would have made a difference. Meanwhile, the Environmental Protection Agency is still studying various schemes to deal with the waste pits. Six scenarios are being studies by the Corps of Engineers at the request of EPA, ranging from making the membrane cap more permanent, to excavating and hauling away the toxic material. Ryan said that a new estimate has placed this last remedy, which is favored by the nearby residents but not the companies, at $100 million dollars, much less than previously stated. Jackie Young, present at the meeting, said that although the settlement was fair, she would like the money to be used for studies of health issues among local residents. HIGHLANDS  Representatives of the local PONY baseball/softball league made an exciting announcement at the Chamber luncheon last Thursday noon. According to Benny Gonzales, PONY Coast Region Director, and Mike Dean, Highlands will host the PONY League World Series next year, from July 14 through 18th. Dean said that up to 200 teams may participate, and all the ball fields in Highlands, Crosby and surrounding areas will be used to accommodate such a large gathering. It is expected that the event will have a large economic impact on the area. If the event goes well, Dean said, it could repeat in Highlands every 2 or 3 years. PONY Baseball and Softball is a non-profit organization with headquarters in the Pittsburgh suburb of Washington, Pennsylvania. Started in 1951, it is dedicated to helping young people grow into healthier and happier adults, primarily through the organization of baseball and softball leagues. Membership is open to children from age 5 to 18 and the leagues are organized with two-year age brackets. PONY became an international organization in the late 1950s. Currently PONY has a presence in 21 countries. In 2009, the PONY Baseball and Softball International board of directors formed a new divisionthe Champions Leaguefor children with special needs. HIGHLANDS  Speaking at the monthly meeting of the Highlands-Lynchburg Chamber, Harris County Commissioner Jack Morman outlined The Future of Precinct 2 for the audience. 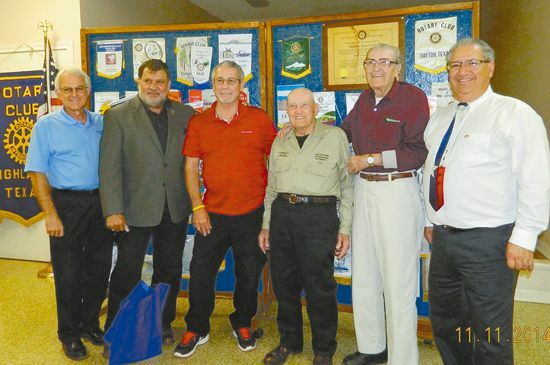 The event took place at the San Jacinto Community Center on Nov. 13. Commissioner Morman set the context for his talk by noting that Harris County was growing at a rate of 13% in the last 3 years, and that meant that the county had to grow services and transportation to meet the needs that were created. He noted that the transportation infrastructure was now at capacity, saying that Proposition 4 which passed on the Nov. 4 ballot, would provide additional funding for highways. He said that there are four projects planned for the next few years, that will cost about 2 billion dollars. As early as 2017, he expects construction to start on a new bridge over the ship channel, to supplement or replace the current toll bridge at the East Loop. with a new bridge, plus a replacement, there would be 4 lanes in each direction where there are now only two narrow lanes each way. This should be complete with 8 lanes, by the year 2020 he said. Crosby-Lynchburg Road will be widened in two phases, he said. Phase I is in design, and will cost $4.2 million. It consists of a 5 lane concrete curb and gutter road with sidewalks on one side, and will run from 1942 to Arcadian Lane in Barrett Station. This coincides with a TxDOT project to widen the road from FM1942 to US90. Morman said engineers were studying several intersections, with the intent to improve them when designs are done. These include Wallisville at Thompson, Wallisville at Crosby-Lynchburg, and Crosby Lynchburg where E. Houston and W. Houston do not now align. He said a speed study has been made of Crosby-Lynchburg, and changes will be made. Mormans Pct. 2 includes almost a million residents, has 1300 miles of county roads, the Lynchburg Ferry and the Washburn Tunnel. It also includes 10 community centers, 50 parks, and 380 employees. TEXAS  Nobody listened and nobody cared what Wendy Davis or any Democrat said this midterm, they just went down quietly in statewide elections. Greg Abbott romped over Davis 52% to 47% with women votes, he extended mens votes to 65% to 34%, and picked up 43% to 57% with Hispanic voters. The wheelchair bound Abbott, appointed by George Bush to Attorney General where he served three terms had 65% of the Caucasian vote, according to exit polls. The filibuster heard round the world was a short bleep against a whirlwind of TV and radio ads echoed over voter rage against big spending. Yeah, Abbott had 58% and Davis 39% after the shouting was done. Take the case of Tea Party favorite Ken Paxton, he easily defeated Sam Houston for Attorney General. When Republican Abe Lincoln won office in 1860 it was a last battle for Sam Houston and four years of horror would follow for Texans. Although the Crosby Post Office still has a photo of Ted Poe, Steve Stockman has been Crosbys Congressman for the last four years believe it or not. He ran against Senator John Cornyn, it did not work. Dr. Brian Babin, the former Mayor of Woodville, has easily defeated (they tell me also ran) Democrat Michael Cole. Cole has been unseen since penning to run. Babin wants to turn the country in another direction with less taxes, more personal, individual responsibility and build a strong military. His son was a Navy Seal for 13 years. He was born in Port Arthur and grew up in Beaumont. 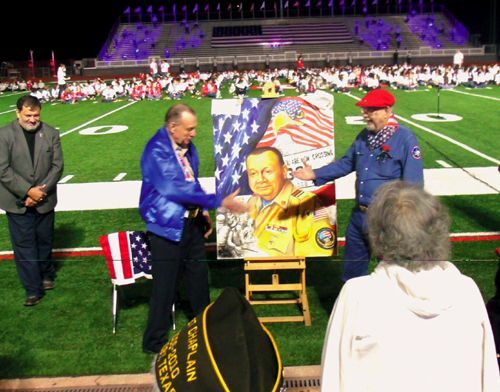 His wife Roxanne is also from Beaumont they have 5 kids and 11 grand-children. Senator John Cornyn romped David Alameel in a good old fashioned woodshed finish, over 17% points, Tuesday. The Senate Minority Whip will rapidly become one of the most powerful men in the world. Cornyn was elected to the senate in 2002, he had served as Attorney General after being on the Texas Supreme Court. Dan Patrick won 58% to 38% over Laticia Van De Putte for Lieutenant Governor. Some say she won the debate, some say it is more important to have a well funded campaign. Patrick may have had some issues in the past but he never lost more than a 17 % point lead and his message has been on the back of Democratic issues from the start. Republican Devon Anderson won over Democrat Kim Ogg for Harris County District Attorney 53 to 47 percent. The Republican said she was concerned over the rhetoric, seriously? Ted Poe would glide back into Congress 73% to 25%. Only his opponent and his mother cared who ran against him. John Swinney will take Dan Kasperzaks post unopposed. Tanya Eagleton will keep her post unopposed. Cathi Whitworth unseated JoAnn Crawford 60.11% against 20.4% with Joe Montemayer taking 19.49%. John Lindsey 58.07% keeps his post against Dan Meaux 41.93%. Becky Streetman won 75.98% to 24.02% for Rodree Carlile in Huffman Position 1. Jerry Jones commanded 59.35% while Vernon Reed took 16.39% and Scott Cloberdants took 24.26% for Huffman ISD Position 2.